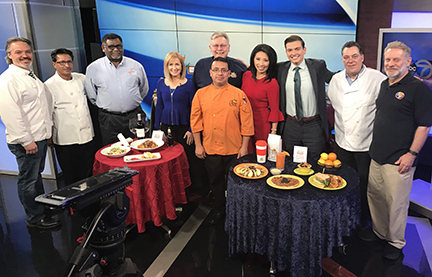 On March 1, Westmont Restaurant Week was featured during a live mid-day segment on ABC-TV Channel 7. The segment, hosted by Judy Hsu, featured four Westmont restaurants that will be participating in event - Bakersfield Wood-Fired Grill, 330 E Ogden Ave; Citrus Diner, 844 E Ogden Ave; Saffron, 6200 S Cass Ave; and Vincitori, 14 N Cass Ave . A total of 27 restaurants are participating in Westmont Restaurant Week, which begins March 2 and continues through March 11. Participating restaurants in Westmont Restaurant Week have put together special menus offering items at $10, $20, $30, and $40. To find out which restaurants are involved as well as what’s on their menu, visit the Westmont Chamber website at WestmontChamber.com and click on the Westmont Restaurant Week logo. Diners are also encouraged to go online and vote in the 2018 Westmont Dining Reader’s Choice Awards from March 15 through April 4, also at WestmontChamber.com. To view the Westmont Restaurant Week segment on ABC-TV Channel 7, click on the Facebook link below. And be sure to like the video.